(Newser) – A body found in North Carolina has been preliminarily identified as a 13-year-old girl kidnapped outside her home, investigators said Wednesday, ending a three-week search involving hundreds of investigators, the AP reports. Lumberton Police Chief Michael McNeill told reporters at a news conference that state crime lab tests indicate the body found late Tuesday is Hania Aguilar. While a final determination will be made with dental records, investigators believe the body is hers. "This is the outcome that we all feared," he said. "We did not want to hear this. We wanted to bring Hania back home and bring her back home alive to our community. It hurts." He pledged to bring whoever is responsible to justice. Investigators said they don't currently have a suspect or person of interest. 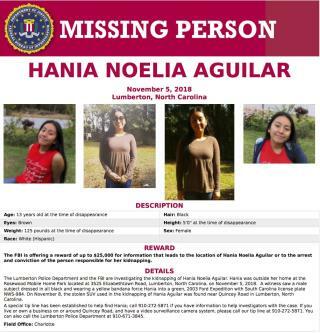 The chief said Hania's body was found in a body of water in Robeson County about 10 miles south of the mobile home park where she was kidnapped on Nov. 5 after going outside to start a relative's SUV before school. I was really, really hoping this was a case where a girl and her boyfriend decided to run off together. How very sad. Had to be someone the family knew. RIP baby girl.